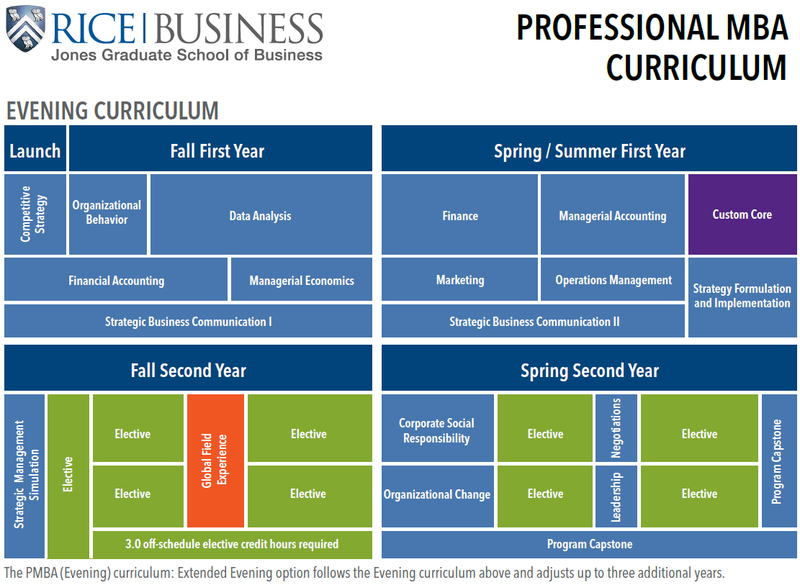 A host of specialized electives in your second year allows students to broaden their professional toolkit beyond the standard general management curriculum. Launch is a 6-day long jumpstart to your Rice Professional MBA experience. For students in both the Evening and Weekend options, there will be TWO mandatory six-day Launch programs over the course of your 22-month experience here. For those in the Evening option, Launch takes place in July before the start of your first year and in March during your second year. For those in the Weekend option, Launch takes place in July prior to the start of each year. 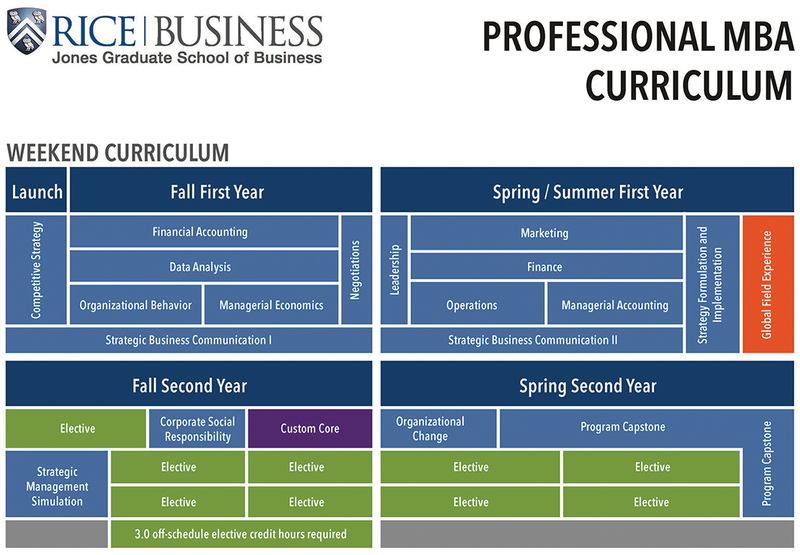 The goal of Launch is to get students quickly acclimated to the MBA experience. Students will start some of the required coursework during Launch. In additional to the academic coursework, students will participate in a series of academic boot camps, career and professional development workshops, team building workshops and assessments and a few camaraderie building activities. The Capstone Course gives Professional MBA students the opportunity to participate in a real-world applied learning activity outside of work and the traditional classroom. It brings together students and their professors to develop recommendations that can help community organizations solve critical strategic challenges, such as major growth or expansion plans, organization turnaround strategies, and new ventures by the organization in need of a business plan. The Capstone Course is offered during the spring semester of the second year. Past cases have included local community organizations such as: AAMA, Bering Omega, Collaborative for Children, Healthcare for Homeless, Hermann Park Conservancy, Historic Houston, Ibn Sina, KIPP, Neighborhood Centers Inc, Passport for Care, Rockwell Foundation, and Shell Center for Sustainability. A health care specialization track is offered to Rice Professional MBA as an enhancement to their degree. This health care track is aimed at health care professionals working full time who are seeking to advance themselves in the industry.